[Update: A new teaser video has made its way to the tubes, and, more importantly, a PC-centric FAQ is now up on the Fable Legends website. System requirements have not been announced, but Lionhead confirmed that it will be a Windows 10 exclusive, and will support DirectX 12 graphics options as long as you're rocking a DX12 video card. Microsoft has announced at today's Windows 10 event that Fable Legends, the latest chapter in Lionhead's long-running Fable series, is heading to the PC, and will feature cross-platform play with the Xbox One version of the game. "We think enabling people to play multiplayer games on Windows 10, across Xbox One and Windows 10, will unlock the potential of Xbox Live and grow [the] social network that's there today," Xbox boss Phil Spencer said, as reported by Polygon. 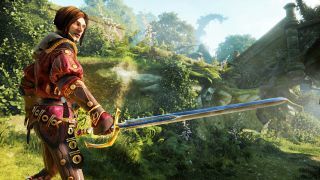 Fable Legends on PC is cool, but the big development here is the promise of widespread cross-platform play between Windows 10 and the Xbox One. If that actually catches on (and call me a relentless pessimist if you will, but I think that's still a pretty big "if"), it could have a huge impact on the PC gaming space, and Microsoft's presence in it. Fable Legends is set to come out later this year.